Scientists at Bikini Bottoms have been investigating the genetic makeup of the organisms in this community. 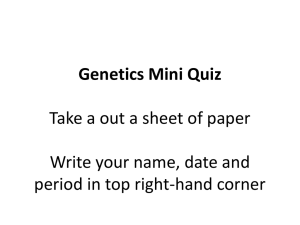 Use the information provided and your knowledge of genetics to answer each question. 1. 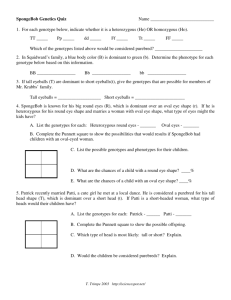 For each genotype below, indicate whether it is a heterozygous (He) OR homozygous (Ho). 2. 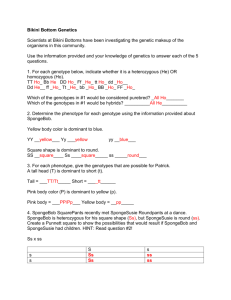 Determine the phenotype for each genotype using the information provided about SpongeBob. Yellow body color is dominant to blue. Square shape is dominant to round. 3. For each phenotype, give the genotypes that are possible for Patrick. A tall head (T) is dominant to short (t). Pink body color (P) is dominant to yellow (p). if SpongeBob and SpongeSusie had children. HINT: Read question #2! A. 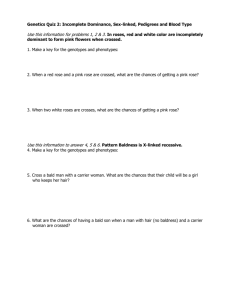 List the possible genotypes and phenotypes for their children. had children. HINT: Read question #3!